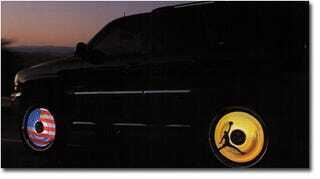 These Pimpstar rims are programmable using a Wi-Fi equipped laptop and can display images as you roll down the street. The LEDs are full color so there is no limit to what you can display on them, and the software allows you to rotate through a series of six different images per wheel. The wheels are carwash-safe and run from the car's power to spare you the embarrassment of running out of battery in the middle of your flashing light display. The wireless technology begs to be hacked and since these are destined to go on the uber-SUVs, we recommend replacing "Low Ridah" with images that say "Losah."